Tom Cruise, Jeremy Renner and Paula Patton star in the action spy thriller Mission: Impossible – Ghost Protocol, the fourth installment of the ‘Mission: Impossible’ film franchise. After the Kremlin is bombed, Ethan Hunt (Cruise) and the rest of the IMF team go deep undercover to investigate a new terrorist threat. Running Time: 2 hrs. 12 min. MPAA Rating: PG-13 for sequences of intense action and violence. 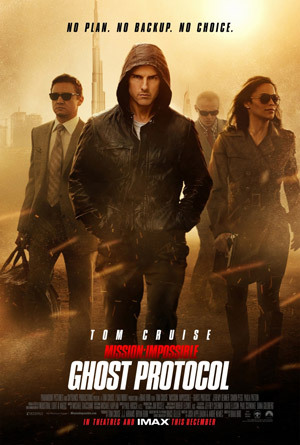 Blamed for the terrorist bombing of the Kremlin, IMF operative Ethan Hunt is disavowed along with the rest of the agency when the President initiates “Ghost Protocol”. Left without any resources or backup, Ethan must find a way to clear his agency’s name and prevent another attack. To complicate matters further, Ethan is forced to embark on this mission with a team of fellow IMF fugitives whose personal motives he does not fully know.